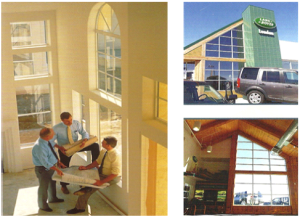 If you have a commercial building and it has windows, if you don’t have tinting you are wasting a lot of energy and missing out on greater comfort for your employees and your clients. Depending on your exposure, window tinting can probably pay for itself within a few years with air conditioning savings. On top of that PG&E will offer you a $1.35 per square foot rebate which adds up to a nice incentive to begin your future savings. Often time the thermostat is on one side of the building. Your people on the hot side of the building want to crank up the air conditioning while the people on the shady side of the building are freezing because they don’t need the cool air. Window film can equalize the temperature by allowing the air conditioning to work more efficiently since it doesn’t have to work so hard to cool off the sunny side of the building. The most effective films block close to 80% of the heat coming into the building via the windows. So that way everyone is more comfortable and your work force is much happier. Film can also greatly reduce the glare from the sun or auto windows in the parking lot. With reduced glare computer screens are much easier to see. Window films can also enhance the outer appearance of your building by concealing the clutter of offices, or blinds drawn to different levels and at the same time it gives your people inside much more privacy.